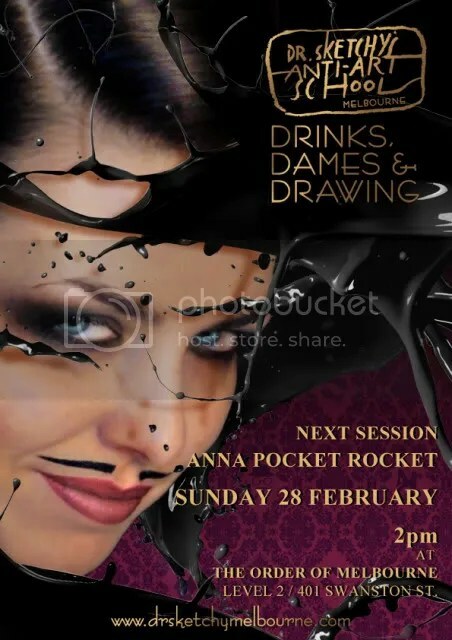 Anna The Pocket Rocket explodes onto the Dr Sketchy’s stage this Sunday 28th February. Anna will perform and pose while we chat, sketch and drink! Mexico, Canada, UK, Middle East, Africa, Malaysia, and Hong Kong! Co creator and performer of the circus cabaret ‘Bittersweet’ (2009 Melbourne Fringe) and recently appearing in ‘Absinthe’ at the Spiegeltent, Melbourne and ‘The Aviator Club’ at the Spiegeltent, Brighton (UK) Fringe. Circus vs Sideshow at the 2010 Adelaide Fringe. show up on the day.